Sea Trading Game- Biomes, Bitmasking, Clouds, and more! I know that I said last week that I wasn't going to have much time for game development for the week, and to not expect many updates. The truth is, I found more time than I thought I would have, and ended up doing quite a bit with that time. This is the latest version of what I have. I'm still playing with the clouds in particular, I have a few things in mind, will see how they work out. This is still an early test, so let me know what you think! I also changed the way the wind is shown on the graph. It's still slower than I would like, I'm trying to figure out how to improve that, but it is much more visible, and I'm happy with the direction it is going. Along with that, I started using more realistic wind patterns, basically I set up the trade winds, with a bit of noise. It can be seen on both of the previous images, but I've been working on bitmasking, basically making the land not look so smooth. Here's a closer up picture to show how it looks. I totally scrapped the system from last week, and went with a shader based approach, which I document exactly how I did it on the Game Development Stack Exchange. Movement is no longer easy to do diagonally if both primary directions have land. As there isn't a visible gap between them, it seemed the appropriate thing to do. I also fixed a bunch of small things, too many and small to enumerate them all. Sufficeth to say the game is better than before. The way I generated the biomes allows for a slight seasonal variation, although I don't think the seasonal variation is quite what it should be. I'm working on how to make it work best still, but it should be cool when I can get it worked out. It's a task for this week, but lower priority. This week I'm planning to get the other half of biome creation figured out, namely getting the moisture part done. When I'm finished, we should have something like deserts being formed, which should look really cool if I can get it all figured out! Beyond that will be numerous speed improvements, the game doesn't work as well as I'd like when fully zoomed out. I'm also trying to work out a more seamless noise, there are still visible seams if you know where to look. Thanks to Jon Gallant, BTW, for his tutorial on world creation, which I used in some part to complete. He's got some great games, including one in the work called GORB that I'll highly recommend when complete. This week as promised I've been working to improve the way the procedural generation works, and how it looks. This is the result. I'm going to still be playing with the textures, and one thing that I'm going to do is to add in some different types of biomes, to add more variety than I currently have. I'm also planning on smoothing out the map so it doesn't look so pixelated, even though fundementally everything will still be tile based, there will be some smoothing factors. I did also make some improvements to speed up the rendering process quite a bit. The end result is the map can be quite a bit larger than it was before, without difficulties! Aside from that, I'm now moving all of the world generation in to the configuration file I recently set up. It's taking a bit of time to get right, but it will make things easier once it is all done. Also, you might notice there are a few different types of land. I have islands, lakes, land, and ocean tile types currently. They each show up a little different, and will have different characteristics. Island ports will act very differently than land based ones, they will have different wants and provide different items than a typical port. As a whole, the game progresses on, and the next few weeks should be very exciting in continuing that trend! I still have a few kinks to work out, but I'm happy overall with the design! The ship is now randomly placed. The world is now cylindrically mapped, meaning you can move almost seamlessly from the left hand side to the right hand site. I've made quite a few other changes as well, it's starting to look like a real world! On tap for this week is to continue to make the land more realistic. I'm planning on adding texture to the land, make islands unique. I might add in costal land, which might have some hazards associated with it, I'm not sure yet. 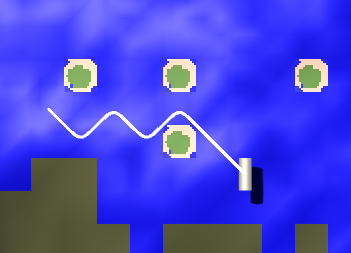 I will add in a lakes feature, which will cause them to look different than other locations. I'm also planning on tweaking how the land masses are created. Another large problem is the city distribution, which has way too many at the poles, for instance. As you can see, the current pattern shows some promise, but it isn't quite what I had in mind. There's also a whole host of performance issues that I'm planning on working through. Stay tuned for more!